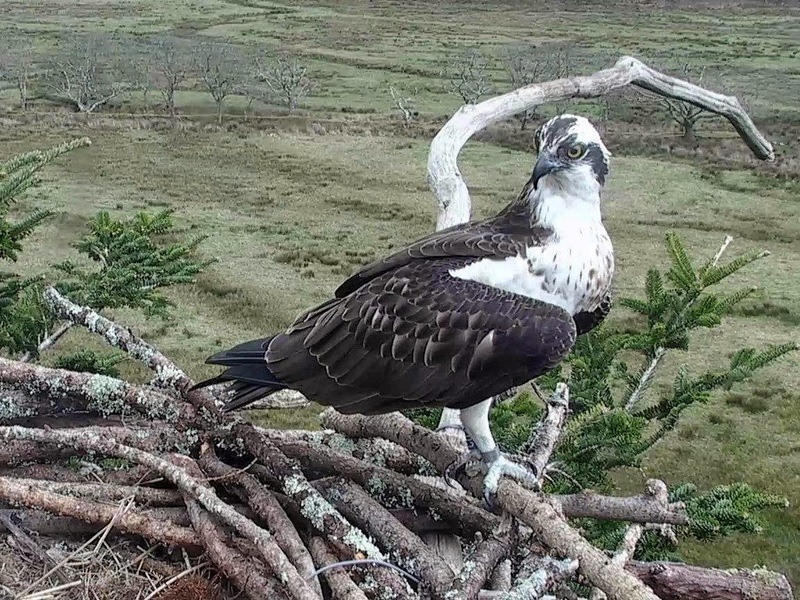 Since 2004 the ospreys on the Glaslyn have produced 2 or 3 chicks each year. They mate for life, overwinter in Africa and travel separately. This year Mrs G arrived back in mid-March and has been waiting impatiently for her mate who has thus far not returned; it’s looking increasingly likely that he has died and will not return. Is that the end of the dynasty? Just recently a young male osprey born in Dumfries, nicknamed Jimmy, has been wooing Mrs G. I visited the excellent new visitor centre this morning as Mrs G was eating a fish which Jimmy had delivered to the nest. Could this be love? The latest report says that Jimmy has already been ousted, and by Blue 80, a male born at the Glaslyn in 2012. Blue 80 is thought to have been mating with his Mum! Is this good news? Will the offspring be well balanced? To keep in contact with the evolving story you should visit the Facebook page.